Bruges, the capital of West Flanders in north west Belgium is small – less than 140km². It is distinguished by its canals, cobbled streets and medieval buildings. 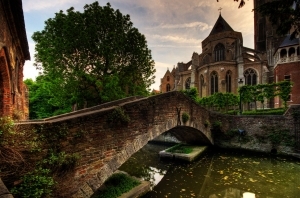 In the latter part of the 19th Century, Bruges became one of the world’s first tourist destinations, attracting wealthy British and French tourists. After 1965 the original medieval city experienced something of a renaissance. Restorations of both residential and commercial buildings, historic monuments, and churches generated a surge in tourism and economic activity. Bruges was awarded ‘European Capital of Culture’ in 2002, and today it attracts some 2 million tourists annually. It is a smart city which has lost none of its grace and style. 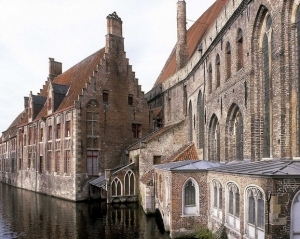 Bruges has most of its medieval architecture intact. Its historic centre has been a UNESCO World Heritage Site since 2000. It remains one of the cultural capitals of Europe, developing links to different parts of the world. It has been closely associated with the school of Flemish Primitive painting and a centre of patronage for artists such as Jan van Eyck and Hans Memling. Many of their works were exported and influenced artists across Europe. Many important collections remain and are exhibited in Bruges today. Art in Belgium has a long history with the innovative Flemish Primitives such as Van Eyck playing a part in the Renaissance. For those who wish to learn more about the history of art in Bruges, there are several must see museums in the city that are well worth a visit. Breton princess betrothed to a pagan prince. She agreed to marry him on the condition she could make a pilgrimage to Rome with 11,000 virgins, but all were murdered on the way back. The largest of the Memlings on display is the triptych of St John the Baptist and St John the Evangelist, commissioned by the hospital church as its altarpiece. The artist’s secular works are also exhibited and include the Portrait of a Young Woman (1480). Your ticket will also allow you into the hospital’s restored 17th century apotheek or pharmacy, which is accessed by an easily missed rear door. Admission to the small historical church-hospital complex, OLV-ter-Potterieis, is also included with a St-Janshospitaal museum ticket. Ring the bell to gain entry and you’ll find fine 15th – 16th century art such as the reliquary of St-Idesbaldus. Bruges’ most celebrated art gallery boasts an astonishingly rich collection whose strengths are in superb Flemish Primitive and Renaissance works, depicting the conspicuous wealth of the city. It is a municipal museum built on the site of the medieval Eekhout Abbey. It houses a wonderful 600 years of Flemish and Belgian art, from Jan van Eyck to Marcel Broodthaers. The museum’s many highlights include its collection of “Flemish Primitive” art, works by a wide range of Renaissance and Baroque masters, as well as a selection of paintings from the 18th and 19th century neo-classical and realist periods, milestones of Belgian symbolism and modernism, masterpieces of Flemish expressionism and many items from the city’s collection of post-war modern art. 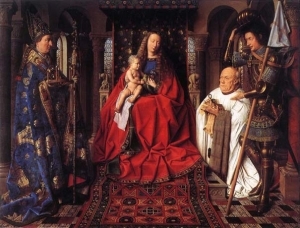 It shows masterpieces including Jan Van Eyck’s Madonna with Canon George Van der Paele (1436) and the Madonna by the Master of the Embroidered Foliage, where the rich fabric of the Madonna’s robe meets the ‘real’ foliage at her feet with exquisite detail. It has appearances from later artistic genres, such as symbolist Fernand Khnopff, plus a surrealist canvas each from Magritte and Delvaux. Flemish Expressionist works from the 1920s show the influence of cubism and German expressionism on Flemish artists. The Groeninge Museum ticket also gives admission to Arentshuis, a stately 18th-century patrician house displaying paintings and etchings of Frank Brangwyn. 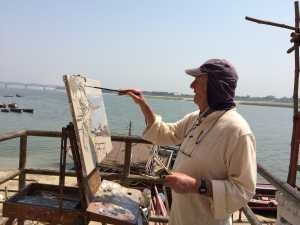 Of particular note are his pictures of the First World War produced when he was the official war artist. The Contemporary Arts are buzzing leading Alain Swimberghe of the Absolute Art Gallery to comment in an article in the Independent, “There’s something going on in Bruges, the arts are growing fast”. The Absolute Art Gallery at Dijver 4 recently re-opened after a total ‘rejuvenation’. This large, light-filled space offers admission for free and represents 25 leading artists, including the celebrated Bruges painter Christine Comyn. Art in Bruges is focusing firmly on the future and is luring contemporary artists, designers and visitors. An excellent way to understand she scale of the cultural scene is to follow the Bruges Art Route aimed at presenting the city’s growing collection of paintings, sculptures and works-in-progress. Three walking or cycling trails have been devised around the centre, taking in studios and galleries where you can see contemporary works by Bruges’ artists. Maps are available at the tourist office or online at www.b-a-r.be. To see more about the contemporary art scene in Bruges visit the website Bruges’ Top 10 Contemporary galleries you should visit.